Covering principles of assessment, evaluation, referral, treatment planning, and report writing, the latest edition of Gary Groth-Marnat's landmark "Handbook of Psychological Assessment" has been thoroughly revised and expanded. Written in a practical, skills-based manner, this classic resource offers coverage of the most widely used assessment instruments and has been updated to include new material and cover tests that are growing in popularity, such as brief assessment instruments. 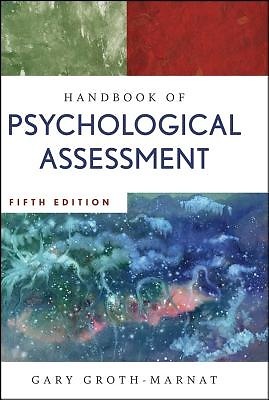 "Handbook of Psychological Assessment" also provides guidance on the most efficient methods for selecting and administering tests, how to interpret assessment data, and how to integrate test scores and develop treatment plans as well as instruction on ways in which to write effective, client-oriented, problem-solving psychological reports. The Fifth Edition provides thorough coverage of the most commonly used assessment instruments including the Wechsler Adult Intelligence Scale®-Fourth Edition (WAIS®-IV), Wechsler Intelligence Scale for Children®-Fourth Edition (WISC®-IV), Wechsler Memory Scale®-Fourth Edition (WMS®-IV), Minnesota Multiphasic Personality Inventory®-2 (MMPI®-2), California Psychology InventoryTM (CPITM), Rorschach®, MillonTM Clinical Multiaxial Inventory-III (MCMI-IIITM), Thematic Apperception Test, Repeatable Battery for the Assessment of Neuropsychological StatusTM (RBANS®), brief assessment instruments, clinical interviewing, and behavioral assessment. Organized according to the sequence mental health professionals follow when conducting an assessment, "Handbook of Psychological Assessment, Fifth Edition" is a practical, valuable reference for professionals looking to stay current as well as for students looking for the most thorough and trusted resource covering the field of psychological assessment.